Our Glide Sideboard in Grey Gloss, White Gloss and Oak really showcases the potential a well designed sideboard can have. 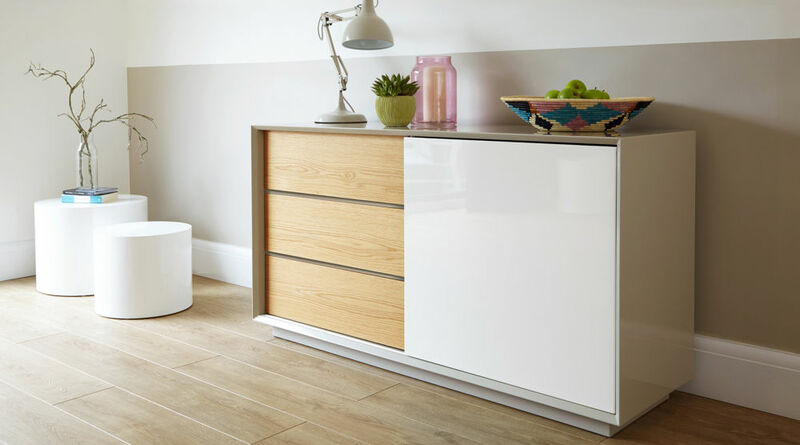 From our Exclusively Danetti with Julia Kendell range, the versatility of this unit means it can easily be placed in different rooms in your home; perhaps in the dining room or your home study. Maybe you'd prefer it in your living room (where it could also be used as a TV stand). No matter where you choose it place it, this Glide Sideboard is sure to add a stylish and contemporary flare to your home interior. This sideboard arrives fully assembled and ready to use. 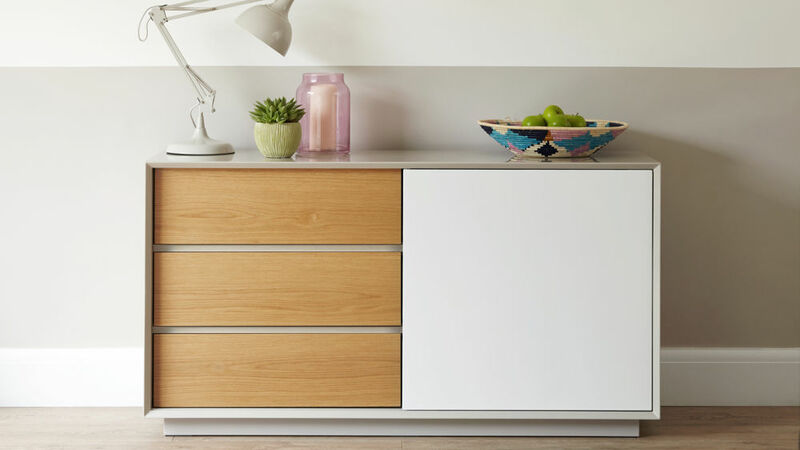 The mitred joints in the corners of this unit are a typical feature on furniture that comes flat packed, so unlike other pieces, with this cleverly engineered sideboard there is no hassle of assembly. You know that you are getting a piece that has been designed with style and longevity in mind. The capacity of this unit really is a perfect size (and we're not just saying that!) At 140 x 45 x 75 cm, the sideboard isn't too big that you wouldn't have enough room to place it, but it's also not too small that it looks a bit meager in relation to the rest of the space. 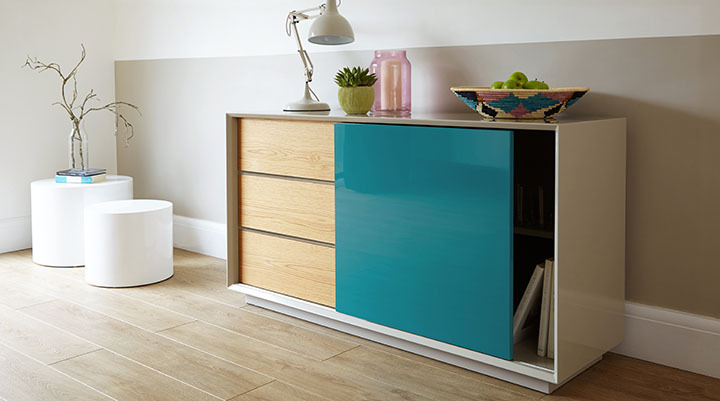 This makes the sideboard compatible with a variety of different living spaces and sizes. 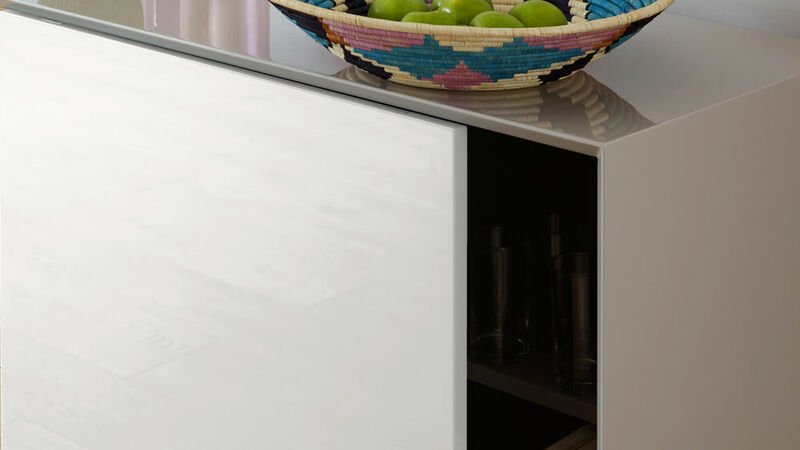 The draws of this Glide Sideboard are chamfered at a 45° angle along the top edge. 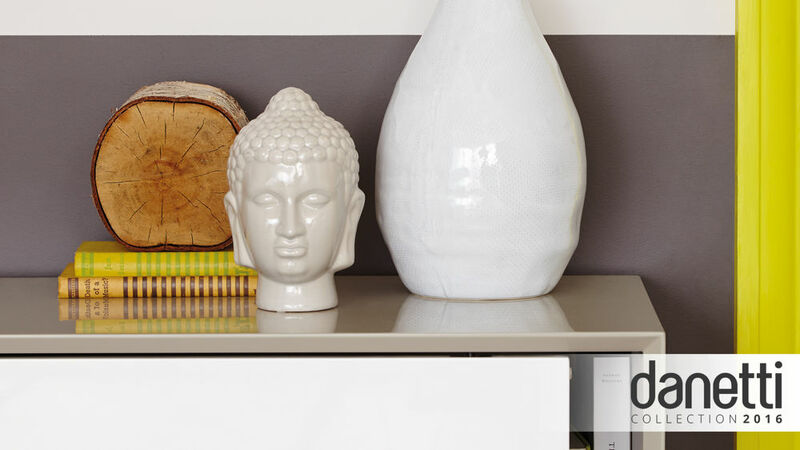 This is a simple detail that really adds to the designer feel of this unit. 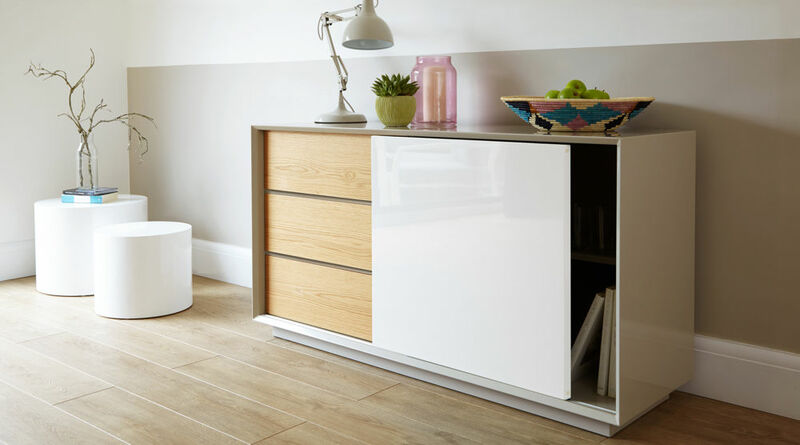 The draws also have soft closures- another elegant and high end feature that gives the unit the feel of luxury without adding an expensive price tag. 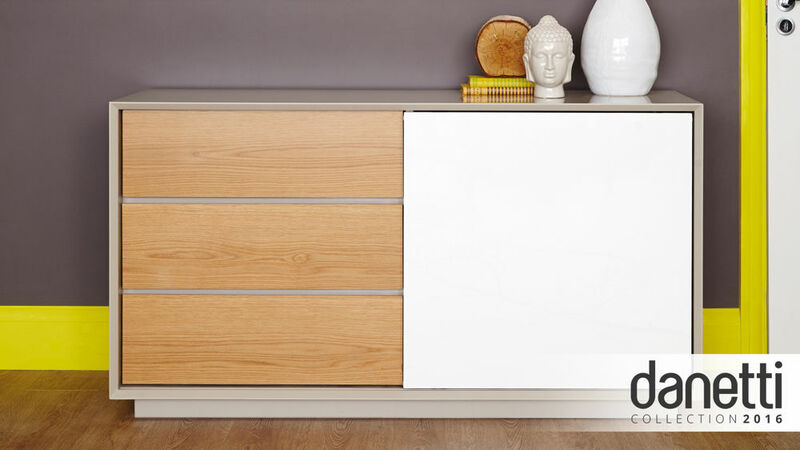 With its grey gloss carcass, three oak draws, white high gloss sliding door and an internal shelf, the mixed finishes of this unit really do create a richer, more tactile look. The addition of the natural oak veneer also has that lovely subtle feeling of warmth timber brings. It's this carefully considered mix of finishes that enables this unit to effortlessly sit alongside other finishes that you already have in your interior. 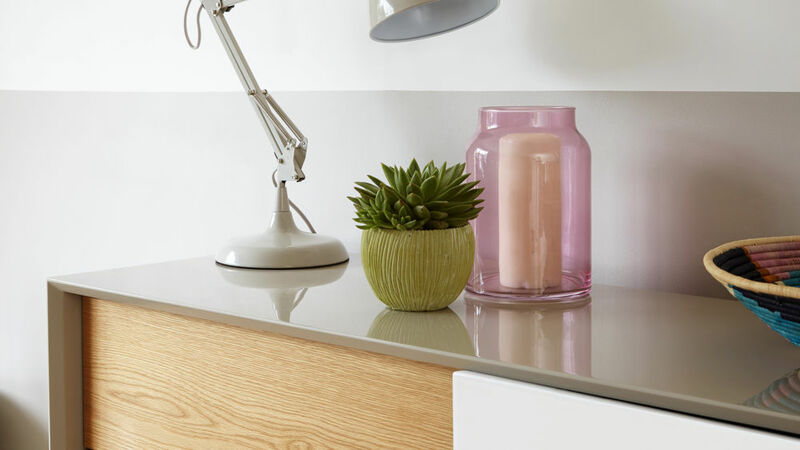 The high gloss finish on both the outer surface and the sliding door of this unit has been applied in 3 layers, each dried for 12 hours to ensure a highly reflective hard finish. It's these 3 layers and extensive drying time that gives this unit a depth of finish that you wouldn't get with a low quality gloss. Our design collaboration with Julia for this Glide Sideboard has resulted in a stylish, practical unit that would look right at home in a variety of interiors. If you like the look and ingenuity of this Grey Gloss, White Gloss and Oak Glide Sideboard, why not take a look at our Reflect White Gloss and Chrome Sideboard or our Form Chrome Barstools, also in the Exclusively Danetti with Julia Kendell range.